Over recent weeks, I have been working on seeing people’s souls. That means that instead of focusing on others’ appearances–this man with a black hat, that man with his colored kippah, the other one with a bare head. This one in her sheitl, that one in her Zionist scarf, the other one with wavy tresses flowing down over her tank top. Instead, of focusing on the ideological statements made by each person’s external appearance, and the ways in which I agree and/or disagree with each one of these statements, I focus instead on something we all have in common–his, her, and my Divine soul. And last week at Tsofia’s siddur party, that was what I did. I looked up at the 75 first-grade girls on the stage, and instead of focusing on the one girl with glasses or the one girl who forgot her line in the play or the one girl with a grey skirt instead of blue–I tried to look into their souls. 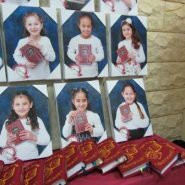 And when I did that I felt each girl’s yearning and excitement for the moment her teacher would hand her her long-awaited first siddur. Just like her big sister has. Just like her Eema and Savta have. To say the words within in to serve Hashem, to feel close to Hashem. Looking up at the stage and focusing on their souls, I realized their goodness was so pure, so intense, it was nearly blinding. Not only my children’s cornflakes bowls forgotten on the table. Not only the smelly socks in desperate need of a change. Not only the specific things about them that I would love to change/improve/alter irrevocably. But also that blinding light of yearning and goodness in each and every one of them. thank you for sharing! much nachat from all your children! Amazing. Thank you so much for describing this process. Instead of saying to ourselves, ” Do not judge others, cause we do not want Hashem to judge us”, now we have a higher way out of this almost “auto pilot” response of judging others. We can connect to their soul, the common denominator…and we can Bless. May Adar be filled with Happiness and Light for all Am Yisroel. This brought tears to my eyes. You have it 100% correct! The Alta Rebbe in the Tanya (chapter 32 -Lev) says that the way to develop true ahavas Yisroel is to connect to the soul – since our bodies are all separate and the physical can be divisive, if we focus on the soul which we all have from the same source we are better able to connect and show ahavas Yisroel. Much nachas from all your children and may Hashem answer all the tefilos of these pure neshamos speedily for good! Just a small question re the photo. Is it the real girls because if so, did you get their mothers’ permission to put them all on your website?